Sales executives are the pillars of an organization and on them depends its success. For an organization to be effective, the sales approach to decision making, along with technological efficiency and facilities available for research and development, is very important. The distinctive way in which various functions such as sales goals, decision making, anxiety management, conflict management, and self management are used and managed comprises the sales style. Those styles, which have damaging effect on the overall health of the organisation, can be easily diagnosed and discontinued, with immediate effect. A diagnostic instrument with a scoring key helps the management to diagnose how far excellent and bad styles are practiced in their organisation so that the best style can be made use of and the bad ones avoided. The present study was undertaken with an aim of understanding and comparing the sales styles being used by executives at various levels in the showrooms of two and four wheelers in a district of Punjab in India. All the 26 salesmen and 13 sales managers working in these showrooms were studied for the sales styles being employed by them. The outcome of this process is discussed in this paper. Sales Goals, Decision Making, Anxiety Management, Conflict Management, and Self Management. Bajpai, N. (2010), ―Business Statistics.‖ Pearson, 362-367. Beverland, M. (2001),‖ Contextual influences and the adoption and practice of relationship selling in a business-to-business setting: An exploratory study.‖ Journal of Personal Selling and Sales Management, 21(3), 207−215. Cespedes, F. V., Doyle, S. X., & Freedman, R. J. (1989), ―Teamwork for today's selling.‖ Harvard Business Review, 67(2), 44−58. Churchill, G. A., Ford, N. M., & Walker, O. C. (1993), ―Sales Force Management.‖ Irwin (Homewood, IL), 124. Dwyer, F. R., Schurr, P. H., & Oh, S. (1987), ―Developing buyer–seller relationships.‖ Journal of Marketing, 51(2), 11−27. Johnston, M. W., Hair Jr., J. F., & Boles, J. (1989), ―Why do salespeople fail?‖ Journal of Personal Selling and Sales Management, 9(3), 53-58. Jolson, M. A. (1999), ―When salespeople fail: Assessing blame.‖ Industrial Marketing Management, 28(1), 19-26. Kotler, P. (1997), ―Marketing Management Analysis, Planning, Implementation, and Control.‖ Prentice Hall of India, 117-123. 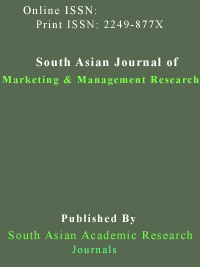 Malhotra, N.K., & Dash, S. (2009), ―Marketing Research: An Applied Orientation, Prentice Hall of India.‖ 76-91, 274-275. Marshal, G. W., Moncrief, W. C., & Lassk, F. G. (1999), ―The current state of sales force activities.‖ Industrial Marketing Management, 28(1), 87-98. Moncrief, W. C. (1986), ―Selling activity and sales position taxonomies for industrial salesforces.‖ Journal of Marketing Research, 23(3), 261-270. Pareek, U. (1997), ―Training Instruments For Human Resource Development.‖ Tata Mcgraw-Hill Publishing Company Limited, 316-322, 446-449. Saxe, R., & Weitz, B. A. (1982), ―SOCO scale: A measure of the customer orientation of salespeople.‖ Journal of Marketing Research, 19(3), 343-351. Selling Styles. [Online] Available http://www.salesmanhelp.com/products/download.php?file=Selling%20styles.pdf December 25, 2012. Weitz, B. A. (1981), ―Effectiveness in sales interactions: A contingency framework.‖ Journal of Marketing, 45(1), 85−103. Weitz, B. A., Sujan, H., & Sujan, M. (1986), ―Knowledge, motivation and adaptive behaviour: A framework for improving selling effectiveness.‖ Journal of Marketing, 50(4), 177-191.